I am going to step right out on a limb and say, after the Hope Diamond, the Taylor-Burton Diamond is second most famous diamond in the world. I am basing the rank on the same factors that made the Hope so well known—the story surrounding it. What is less well-known about the massive pear-shape diamond is that it was a logistical nightmare to wear. The most expensive diamond in the world at the time, it cost Burton just over one million dollars. While the number may be a pittance by today’s standards, back in the 1960s a million dollars really meant something. 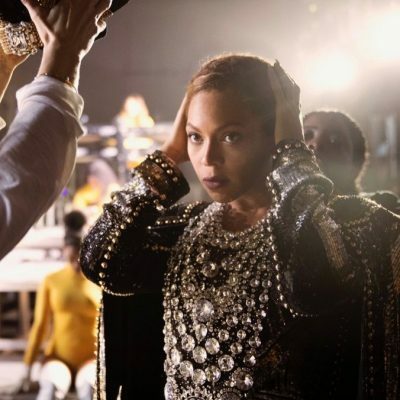 Due to the value of the diamond, the insurance company required that Ms. Taylor be attended by heavily armed security guards every time she wore it and she was only allowed to wear it a certain number of times every year. 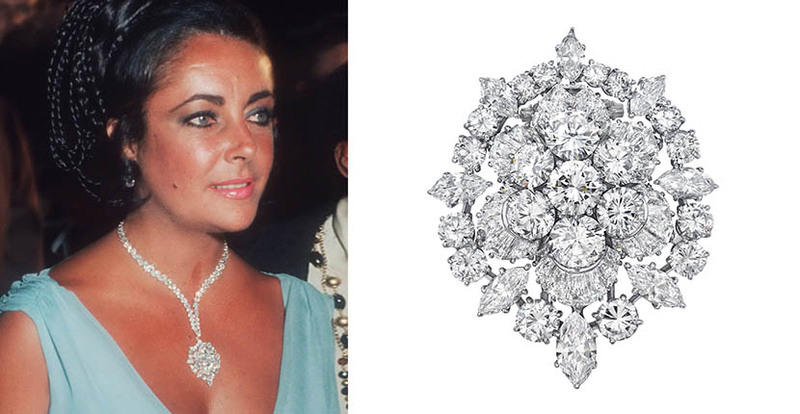 Well, sometimes when Elizabeth Taylor wanted the look of the Taylor-Burton Diamond without all the hassle of the security detail, she removed the big gem from the necklace and replaced it with a Van Cleef & Arpels pendant/brooch Burton gave her as a Christmas present in 1967. 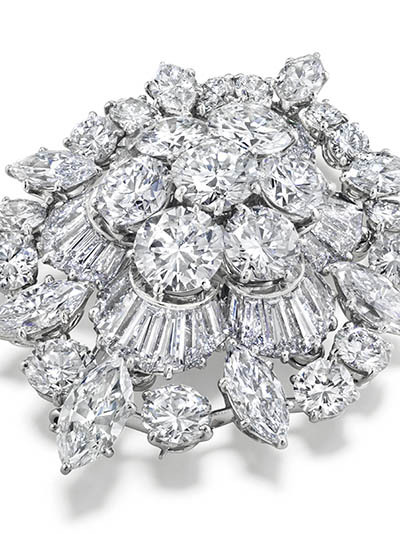 The abstracted floral motif of the jewel was set with circular, marquise and baguette-cut diamonds. A pendant hoop and detachable brooch fitting were on the back. It is a perfect example of late 1960s styles with all the large fancy shape stones. At the 1974 premiere of That’s Entertainment, the actress was photographed in the Van Cleef & Arpels brooch suspended from the Taylor-Burton Diamond Cartier necklace (seen in the composition at top). 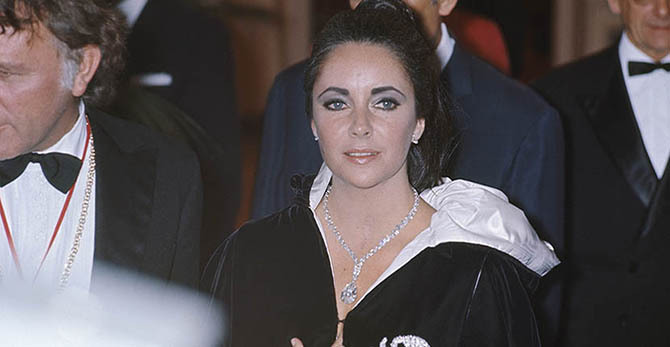 Shortly after the couple divorced in 1979, Elizabeth Taylor sold the Taylor-Burton Diamond and donated a portion of the proceeds to fund the building of a hospital in Botswana. While the actress expressed regrets over the years about selling the diamond, she most likely chose to do so because the prohibitive insurance policy. 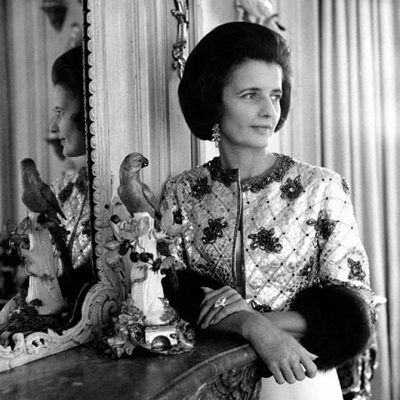 She continued to wear the Burton brooch on the necklace that once suspended the famous diamond for decades. The Van Cleef & Arpels brooch was sold in Elizabeth Taylor’s estate at Christie’s on December 13, 2011. Now it is being offered by Christie’s again on June 20, 2017. The estimate for the jewel is $200,000-$300,000.